In the 1950s what was then called the Department of Traffic developed special posts used on pedestrian walkways over parkways and expressways. Several clutches of them survive in town: I can name the 33rd Avenue and 39th Avenue pedestrian walkways over the Clearview Expressway in Bayside, as well as a couple over the Long Island Expressway and FDR Drive in Manhattan, as well as the Gowanus Expressway at Summit Street in Carroll Gardens, Brooklyn. 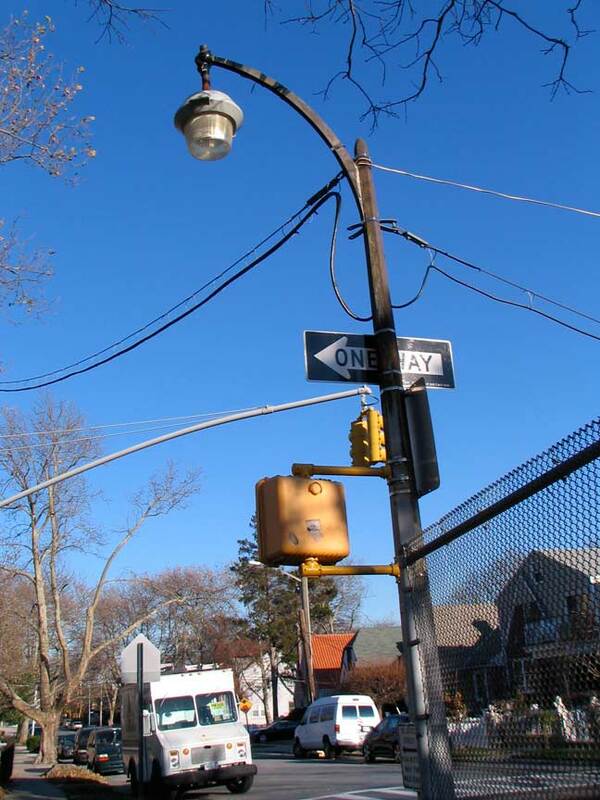 Most have been outfitted with sodium vapor “bucket” lamps, the only pendant lamp developed in use in NYC between about 1975 and 1990, while a very few still have the Westinghouse AK-10 “cuplights” that they were originally built to support. This one at 33rd Avenue is kept very busy supporting a DONT WALK signal and a pair of traffic signs. At over 60 years old, they’re getting to be living relics. A lot like your webmaster! Gotta love that electrical tape fix at the top. Kevin, you’ll never be old. Your enthusiasm and energy continues to keep NYC’s history alive. It should be noted that street lights were not under the control of the Dept. Of Traffic until the 1980’s, when traffic lights and streetlights were consolidated under the Dept. Of Transportation. 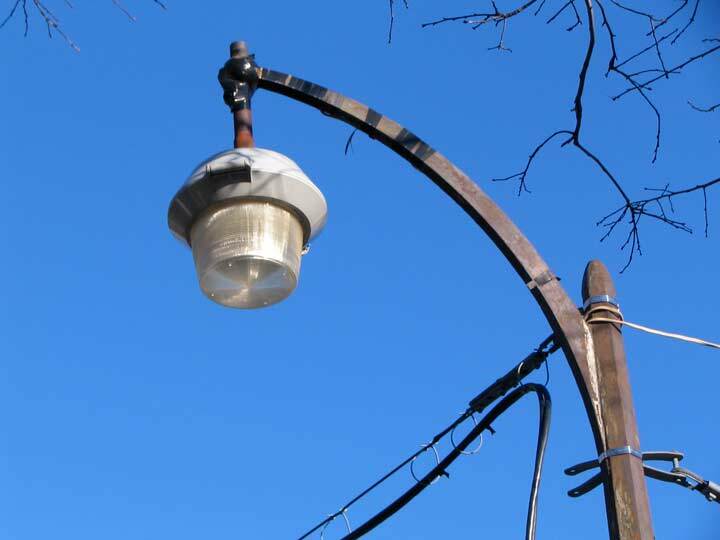 Prior to this, streetlights were under the control of the Bureau Of Gas And Electricity, part of The Dept. Of Water Supply,Gas And Electricity. This led to some incredible bureaucratic bungling. During the 1960’s , many of the original traffic lights(red/green lights on short cast iron poles)were being replaced by overhead mounting red/yellow/green lights on M2A traffic poles. Since traffic lights and street lights were different agencies,the new traffic poles would be mounted on the opposite corners from the streetlights,even if this was not the best positioning of the traffic signal heads. In 1973,a friend was hired as an electrical inspector for a program for the Bureau Of Electrical Control (the agency that now had control of street lights). The proliferation of poles during the past decade had reached eyesore proportions. My friends’ job was to go out and survey intersections to see if the poles could be consolidated. It was about this time that some coordination started between the agencies. If new traffic signals were to be installed,the streetlights would be removed and the traffic light poles would be installed, equipped with a shaft extension adapter to hold the street light arm. Incredibly,when it came time to paint the traffic poles,they would not paint the street light portion. When streetlights were being painted,they would not paint the traffic portion.